Speaking at New England College's President's Speaker Series, Ohio Gov. John Kasich told the New Hampshire audience that he doesn't know if he'll run again for the White House. 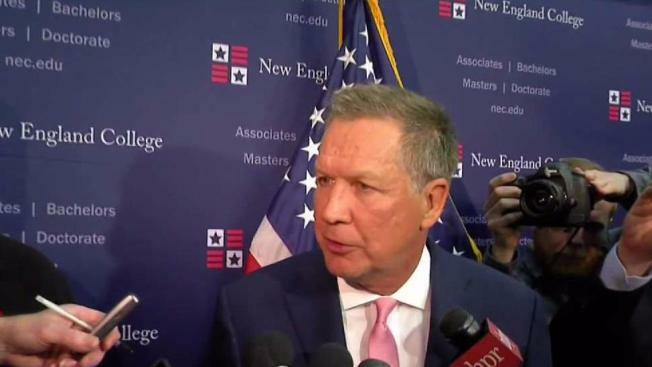 Two years after coming in second to Donald Trump in the New Hampshire Republican primary, Ohio Governor John Kasich spoke at New England College Tuesday night, presenting a sharp contrast to President Trump‘s policies. On DACA, Kasich commented, "So it’s Easter and you wake up and find out we’ve been shipped out, I mean, come on, leaders don’t do that." When asked if he would receive Vladimir Putin in the Oval Office, like there is talk of Trump doing, Kasich responded, "You mean like now? No. Not now. Receive him to do what?" On the media, Kasich said, "I’m very concerned about the assault on the press where it’s all 'fake news. 'You wrote something that I don’t agree with, that’s fake." The 2016 Republican presidential candidate says he doesn't know if he'll run again for the White House. He is in his last year as governor and says he must finish that first. He's term-limited and cannot seek re-election. "All of my options are on the table. But that doesn’t mean yes or no or this or that, I really don’t know. I want to finish my term and nine months and then we go through the elections and then we will see where we are." Kasich’s appearance drew some big-name New Hampshire Republicans and even a former Connecticut congressman. Former Rep. Christopher Shays said, "I think he is the best candidate, the best American to run for president and I would love him to be our president." Governor Kasich, who focused his presidential efforts in New Hampshire, says he’ll be back to speak in the Granite State in November, but his biggest supporters hope he is back long before that.